This article follows a previous one on the Malay and Bumiputera special rights. A couple of days ago it was made known to the public that the street names in a certain suburb of Shah Alam were changed to Chinese characters, in contravention of Sections 2 and 9 of the National Language Act, 1963/67. Yesterday, HRH The Sultan of Selangor decreed that the street names be taken down and replaced by ones in the Malay language, which is the National Language. I mentioned in a previous post that a national language is a tool to unite the peoples of Malaysia. It was the intention of our forefathers in the quest for independence to have ONE language to unite all, and that is the Malay language with a Romanised written form, so that the non-Malays could learn the Malay language rapidly (Tunku Abdul Rahman, The Road to Independence, 1984: pp.112-114). I gather that those were the reasons His Royal Highness issued the decree mentioned above – in line with one of the functions of the Malay Rulers: to care for the people’s welfare. Therefore, if there is any issue that may cause tension, the Malay Rulers will step in to remind the people to respect each other and to respect the laws. What I find disgusting in this episode is that the local government, or local council, allowed for the street name change to happen, forgetting that every instrument of the government is acting on His Majesty’s Service. Not too long ago, all government envelopes had URUSAN SERI PADUKA BAGINDA stamped at the top; that was until someone who was not fond of the Rulers changed that to URUSAN KERAJAAN. Essentially, all government branches, including the Federal cabinet as well as the state executive councillors, are acting on behalf of the Yang DiPertuan Agong and Sultan (in the case of states). They are not independent of the Rulers – which is why they are sworn in before the Agong or the Sultan. The Malay Rulers have divested much of their independence now as they did before during the period of British administration. However, both they and their state remain sovereign. Independence is not equal to sovereignty. The British were here through the various treaties signed with the respective Malay Rulers. Save for the Japanese occupation, Malayan Union period, Pulau Pinang, Melaka and for a while, Pangkor, the Dindings and Larut, Peninsular Malaysia was never under British colonial rule. In Duff Development Company Limited v The Government of Kelantan (1924), the House of Lords similarly upheld the sovereignty of Kelantan and its Ruler was not intended to be qualified by the terms of the treaty. In Pahang Consolidated Company Limited v State of Pahang (1933), the Privy Council summarised the constitutional position in Pahang as follows: subject to the limitations which the Sultan had from time to time imposed upon himself, he remained ‘an absolute ruler in whom resides all legislative and executive power.’ (See, 1894; Q.B 1924; A.C and M.L.J). The British were in the Malay states to assist the Malay Rulers in the administration and management of their respective states, and were under the Rulers’ payroll. The only matters that they could not touch were the states’ Islamic affairs and Malay customs. “From the first to last the theoretical independence of the states was the governing factor in the system evolved in Malaya. The so-called ‘Resident’ was in fact a Regent, practically uncontrolled by the Governor or Whitehall, governing his ‘independent’ state by direct, personal rule, with or without the co-operation of the native ruler.” (Sir F.D Lugard, The Dual Mandate in British Tropical Africa, London, 1926: pp.130-1, vid. pp.8-10). One such Resident was of course James Wheeler Woodford Birch who, in the words of Sir Richard Olaf Winstedt, “dashed into Perak’s Augean Stables like an angry Victorian schoolmaster, confident that it could all be cleaned up with a little firmness and decision.” (Winstedt, History of Perak, JMBRAS, xii, 1). Birch’s monumental tactlessness, especially over the regulation of taxes, drove all the Sultan’s Chiefs into frantic opposition which resulted in his assassination in 1875. “There is no question at all of altering in any degree, even by a comma, the Treaties which bind us, and which are charters of the agreements with the Rulers both of the Federated and the Unfederated Malay States.” (British Parliament Hansard, Commons Sitting, Class II, HC Deb 14 July 1933 vol 280 cc 1429). With the Independence of Malaya, all the administrative powers handed down by the Malay Rulers to the Federal and State Councils was passed to the government that was chosen by the people of Malaya in the 1955 elections. The Federal cabinet administer the government of the Yang DiPertuan Agong, who was elected by the Malay Rulers to represent Their Highnesses at Federal level, while the Menteri Besar and state executive councillors administer the state for the Sultans. The Malay Rulers, as owners of this land, continue to enjoy their position with their income regulated by the respective laws, and receive advice from the Menteris Besar (or in the case of the Yang DiPertuan Agong, the Prime Minister). The same was noted by Mark R Gillen of the Faculty of Law, University of Victoria (Gillen 1994:7). “a mistake to think that the role of a King, like that of a President, is confined to what is laid down by the Constitution, His role far exceeds those constitutional provisions” (Azlan Shah 1986:89). In 1867, Bagehot asserted in “The English Constitution” that the Constitution needed two parts: the dignified – to excite and preserve the reverence of the population’ and the other, the efficient – to ‘employ that homage in the work of government’. The monarch was the prime example of dignity in this sense and the Prime Minister (Menteri Besar) and his cabinet (executive councillors) of efficiency. Therefore, the monarch, while lacking executive power, had an important constitutional role. HRH The Sultan of Selangor was correct in the exercise of his function when reminding the people to not touch on the matters that have been agreed upon and are already enshrined in the Constitution – the sanctity of Islam, the National Language, the Malay and Bumiputera special rights, and the position and function of the Malay Rulers. Such action, had the Sultan not interjected, would be naïve and dangerous to the fabric of the society. One of the functions and roles of the Malay Rulers is to safeguard the interests of the Malay and Bumiputera communities enshrined in the Federal Constitution. That is what HRH The Sultan of Selangor did when he voiced out against ICERD and liberalism. In the previous posts (The Malaysian Concord (Part 1) – The Sanctity of Islam and The Malaysian Concord (Part 2) – The National Language) I have shown you why Islam was made the religion of the Federation, and why the Malay language was made into the National Language. I also explained why the Reid Commission was just a commission and not a party to the discussions and negotiations to the independence of Malaya and whatever put forth by the commission were recommendations for the Constitution, not the hard-and-fast rule. The economic situation of the Malays, pushed to the hinterland by the immigrants, became dire that they had to take loans from the chettiars putting their land as collateral. When even the interest could not be serviced, these lands were taken into possession by the moneylenders. The Federated Malay States government intervened and introduced a series of legislations to curb the Chettiars’ operations, one of which was the Malay Reservations Enactment, 1913, which objective was “to provide means for preventing the passing of Malay landholdings into the possession of foreigners”(Frederick Belfield, Legal Adviser, FMS, Report for the Secretary of State on the FMS Enactment 15 of 1913). “It will mean that we shall free our peasantry from the clutches of those people who now remit to India the large sums of which they now bleed the people.”(Hastings Rhodes, Objects and Reasons, Malay Reservations Enactment of 1913, quoting a Minute by E.W Birch dated 7 September 1910; in Selangor Secretariat, File 3013/1912, Conf. File 10/1912). Two constitutional changes were introduced in 1909, the establishment of a Federal Council, and the enactment to change the title Resident-Generalin the FMS to that of Chief Secretary. The Governor responsible for these introductions, Sir John Anderson, said that the intention of these changes, in his words, was for“the full safeguarding of Malay interests.” (Proceedings of the Federal Council, FMS, 11 December 1909). “The moral is clear that real danger lies ahead if the Malays do not get their share of the benefit of the development of their own country.”(C.O 273, Vol 539, Laurence Guillemard to Secretary of State, 3 May 1927). To put things in perspective, not only were the Malays left out economically, they were also already minorities in the Federated Malay States. According to the census of 1931, the population of the FMS comprised of a Chinese majority (41.5 percent), followed by Malays (34.7 percent), Indians (22.2 percent) while various other ethnic groups made up the remaining 1.6 percent (Loh Fook Seng, Malay Precendence and the Federal Formula in the Federated Malay States, 1909 to 1939, JMBRAS, Vol 45, 1972: p.48). When the discussions for the independence of Malaya took place, the MCA which represented the interests of the Chinese community in Malaya, agreed for the continuation of Malay special privileges that was already being enjoyed by the Malays under the Federation of Malaya Agreement of 1948 (Straits Times, 28 August 1956). Even on the issue of making Mandarin a national language at par with Bahasa Melayu, the MCA Central Committee which debated the Alliance memorandum to the Reid Commission put the issue to a vote: 15 votes were against the recommendation that Mandarin be recognised as an official language, 14 voted for, 31 abstained (Straits Times, 28 August 1956). Reid Commission was required by its terms of reference to “safeguard the special position of the Malays and the legitimate interests of the other communities” (CO 889/6, C.C. 2000/15, Summary record of Commission’s meeting, 27 August 1956). The Constitutional Bill was then debated in the England’s House of Commons. Three amendments to the Bill was sought. The third proposed amendment pushed by Conservative MP Joan Vickers (Devonport) noted that the 15-year limit for Malay special rights recommended in the Reid Report was omitted from the Bill. However, the majority felt that any eleventh-hour amendment could upset the political compromises embodied in the Constitution (Commons Debates, 19 July 1957, pp. 1590-1591). The Secretary of State concluded that any accepting of proposed amendments would result in the reopening of all issues on which agreement had already been reached (Ibid., pp. 1592-1594). Therefore, all the proposed amendments were rejected and the Federal Constitution of Malaya, as part of the Malayan Independence Bill, was adopted unchanged. These special rights were then extended to the Bumiputeras of Sabah and Sarawak through Paragraph 62 of the Malaysia Agreement, 9 July 1963, pages 43 and 44. But this did not come easy. Many non-Bumiputera groups were opposed to the idea of according the natives of Sarawak with special rights. A group from the Sarawak United People’s Party led by Ong Kee Hui had a contempt for the backwardness of the natives and had regarded their leaders as men of no consequences. This prompted the SUPP’s leader in Sibu Jonathan Bangau, an Iban, to resign. The Ibans, however, told the Cobbold Commission that they were all for Malaysia and some even emphasised on the need for a speedy arrival of better education and development for the Iban community. In North Borneo, the only negative views were given by the British officials and expatriates as well as the rich (non-Bumiputera) local businessmen. Both Donald Stephens (Chairman of the Committee of the North Borneo Alliance) and Stephen Kalong Ningkan (Secretary-General of the Sarawak Alliance) both accepted the Inter-Governmental Committee report. Sarawak Council Negri voted unanimously to adopt the report on 8 March 1963, while the North Borneo Legislative Council unanimously adopted the report on 13 March 1963. The special rights of the Malays and the Bumiputeras are there to protect their interests so that they do not get swallowed whole in their own land. The Fijians learnt this the hard way when the Indo-Fijian (Indian descent) minority which numbered less than 40 percent of the population, dominated everything from government to economy, leaving the ethnic Fijians on the sideline. If the rights of the Malays and the Bumiputeras that was agreed upon by our forefathers are now being questioned, should they now not ask for a better position for themselves? Perhaps a 70-percent equity and quota in everything from now on, or something even better? IN part one (The Malaysian concord (Part 1) – the sanctity of Islam), I wrote about HRH The Sultan of Selangor’s displeasure of the challenge by a certain group against the sanctity of Islam, the National Language, the special rights of the Bumiputera, as well as the function and position of the Malay Rulers that are enshrined in the Federal Constitution. I read the comments on the issue at the online page of a mainstream newspaper. What I saw was blatant ignorance on the part of the readers. This ignorance, if gone unchecked, will be dangerous to the future of this nation. Many commentators mentioned that the Reid Commission had recommended for certain special privileges to be reviewed after 15 years, but was never done. I need to put this record straight. In many of my writings, I mentioned that those party to the agreement of the independence of Malaya were the British government, the Malay Rulers, and the Alliance party as the government of the day. Lord William Reid was tasked to form an independent commission to draft the new constitution for a post-independence Malaya. The idea to have an independent, non-Malayan constitutional commission came from Tunku Abdul Rahman himself. The Malay Rulers were for a commission that consist of local politicians, lawyers and other professionals, just as India and Burma (later Myanmar) had. Ghana, Pakistan and Ceylon (later Sri Lanka) opted for a mix of local and foreign constitutional experts. Tunku felt that it was important to have a non-Malayan independent commission to draft the Malayan post-independence Constitution as it would be able to avoid local prejudices and perform its task with complete impartiality (PH/A/008/4, MCA Files, Memorandum by Tunku Abdul Rahman, 1 March 1955). This he intimated to Sir Donald Charles MacGillivray, the last British High Commissioner in Malaya, and told the latter before leaving for the January 1956 Independence Conference in London that the commission should consist of legal experts with sufficient knowledge of constitutional developments in the Commonwealth (CO1030/132(3) MacGillivray to A.M. MacKintosh, Head of the Southeast Asia Department of the Colonial Office, 5 January 1956). So again, I would like to reiterate that the function of the Reid Commission was only to draft the Constitution with input from all those party to the independence agreement, and make recommendations to those parties. The Commission itself was never a party to the discussion, let alone of the agreement. Going back to the issue of the national language, it was in the Alliance’s manifesto for the 1955 federal elections to have a national language to foster a common nationhood, with plans to upgrade the Malay language as the national language. As safeguarding the interests and rights of the Malay and Chinese communities being the key features of its manifesto, protection for the languages of the other communities as well as their growth and development was also guaranteed. The earlier version of the Alliance’s memorandum to the Reid Commission did state a 15-year time frame for the special position of the Malays and Malay as the national language. However, in view of the radicals in both Umno and MCA at the time where the former questioned the principle of jus soli while the latter questioned the need for Malay special rights and a national language, an inter-communal constitutional bargain was made and was conveyed to the Reid Commission orally that the time-frame be omitted (PH/A/008/4, Memorandum by Tunku Abdul Rahman, 1 March 1955). This was the version that was accepted not just by those within the Alliance, but also by the Malay Rulers as well as the British government. Five years later, this same subject was brought forth to all who would be affected by the formation of the Federation of Malaysia. 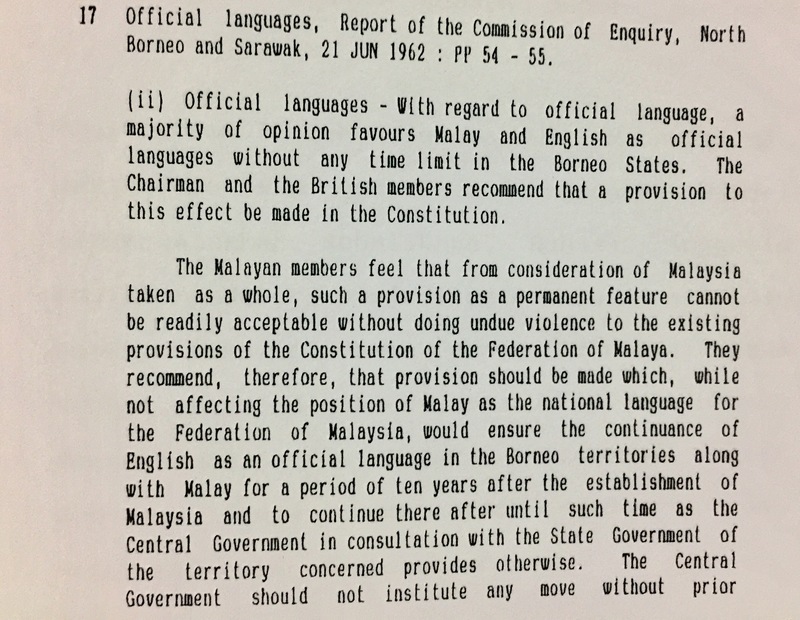 The Malaysia Solidarity Consultative Committee chaired by North Borneo’s Donald Stephens in its memorandum stated the it accepted the view that the Federation of Malaysia should have a national language and placed no objection to the adoption of the National Language of the Federation of Malaya, Singapore and Brunei which is also the lingua franca of the region (Malaysia Solidarity Consultative Committee Memorandum, 3 February 1962: pp. 122). Even the Cobbold Commission, a Commission of Enquiry set up to gauge the support of the people of North Borneo and Sarawak for the creation of the Federation of Malaysia noted in its report that its Chairman (Lord Cameron Fromanteel Cobbold) felt in view that Malay is the closest to a lingua franca in Borneo than any other language, no derogation from the Federal provision was necessary (Report of the Commission of Enquiry, North Borneo and Sarawak, 21 June 1962: pp. 54). The Inter-Governmental Committee (a committee that consists of the Federation of Malaya, and Great Britain – looking after the interests of its colonies of North Borneo and Sarawak) reported that Malay should be the language of the Federation of Malaysia, but Article 152 of the proposed Federal Constitution (based on the Federal Constitution of Malaya) be modified in its application to the Borneo states so as to secure that the English language may be used in an official capacity for a period of ten years after Malaysia Day (Malaysia Report of the Inter-Governmental Committee, 1962: pp. 26). A national language is an important tool for creating “national” consciousness. Hindi is the national language of India, as Mandarin, Thai and Bahasa Indonesia are respectively in the China, Thailand and Indonesia. It is difficult to understand why, after 61 years, are we still having this argument about what the national language should be. What kind of national identity are we to have when we cannot even communicate with each other in one common language? Saya Mej xxxxxxx Bersara ingin memperingatkan semua anggota Tentera Dan Veteran ATM supaya menolak Barisan Nasional dan mengundi Pakatan Harapan (mengunakan logo PKR) Di PRU 14 ini kerana selama 60 tahun kerajaan BN gagal mertabatkan ATM Dan Veteran. SEJAK MERDEKA, KERAJAAN BARISAN NASIONAL MENGHALANG YANG DI PERTUAN AGONG, SEBAGAI PANGLIMA TERTINGGI ANGKATAN TENTERA UNTUK MEMBERI KUASA MUTLAK KEPADA MAJLIS ANGKATAN TENTERA BAGI MENTADBIR DAN MEMBUAT PERATURAN TERUTAMA TENTANG SYARAT SYARAT PERKHIDMATAN, GAJI DAN PENCEN ATM. Saya ingin memberi tahu bahawa kepincangan mengenai syarat2 perkhidmatan anggota dan masaalah hak hak Veteran kebanyakkannya berpunca daripada keengganan kerajaan Barisan Nasional mematuhi undang2 dan peraturan2 yang sedia ada dan menafikan badan yang ditugaskan oleh undang2 untuk membuat perancangan atau dasar ATM. Undang2 adalah peraturan hidup. Negara Yang ditadbir tidak mengikut lunas undang2 adalah negara yang tidak tergolong kepada negara rule of law atau negara Yang tidak tertakluk kepada kedaulatan undang2. Jika undang2 kerap dicabul, undang2 tidak bermakna lagi. Kita sebagai rakyat Yang cinta pada negara hendaklah berani mempersoalkan jika kerajaan membelakangkan undang2 negara dan penguatkuasaanya untuk kebaikan rakyat. Kerap kali kerajaan Barisan Nasional mengunakan undang2 hanya untuk menekan rakyat dan bukan untuk membantu rakyat. Semua anggota ATM, Veteran dan rakyat jelata hendaklah faham bahawa Perlembagaan Persekutuan adalah merupakan Satu kontrak sosial rakyat yang tidak boleh di persoalkan Dan diganggu gugat oleh mana2 mana2 individu atau mana2 pihak terutama oleh parti politik yang memerintah. Perkara 41 perlembagaan persekutuan yang menyatakan bahawa Yang Di Pertuan Agong hendaklah menjadi Pemerintah Tertinggi Angkatan Tentera Persekutuan. Perkataan hendaklah tersebut bagi saya bermaksud SPB YDP Agong mempunyai kuasa mutlak untuk memerintah Dan mentadbir ATM. Jika ada sesiapa hendak mempertikaikan kuasa SPB YDPA ini, saya cabar mereka membaca kuasa budicara Baginda dalam Perkara 40(2) dan 40(3) perlembagaan persekutuan. ATM diketuai oleh Panglima Angkatan Tentera (PAT) Yang berpangkat Jeneral, Laksamana atau Jeneral TUDM. Beliau adalah ketua professional ATM Yang dilantin oleh SPB YDPA. PAT memerintah dan mentadbir ATM melalui Jawatankuasa Panglima2 (JPP) dan juga yang paling penting keputusan mengenai pemerintahan, pentadbiran dan Disiplin Di bantu Majlis Angkatan Tentera (MAT) dimana kuasa MAT datang terus dari YDPA. Yang membuat Kita sedih sekarang kita lihat ATM di tadbir secara terus oleh Menteri Pertahanan, orang politik Dan KSU Yang tidak ujud kuasa mereka dalam undang2 untuk memerintah ATM secara langsung. – Dan segala perkara lain yang berhubungan dengannya. viii. Dua orang anggota tambahan, jika ada, Sama ada anggota Tentera atau premenopausal, dilantik oleh YDPA. Sejak pemerintahan Barisan Nasional, perkara ini dicabuli, hak hak Yang Di Pertuan Agong Dan hak MAT Di nafikan secara tak langsong. Kuasa yang di beri oleh Perlembagaan Persekutuan kepada MAT sangat Luas tetapi sedih nya kuasa ini di cabuli dan di rompak oleh pemimpin Barisan Nasional dan KSU Kementah, yang pada dasar nya tidak faham jiwa tentera tetapi mengawal ATM semata2 nya untuk kepentingan politik Peribadi Dan bagi KSU/KSN pula cuba menjadi badan Yang paling berkuasa Di dalam perkhidmatan awam kerajaan malaysia. saya Akan buktikan Dalam siri penerangan saya ini. iii. Membuat peraturan2 gaji Dan elaun Dan emoluments lain bagi pegawai Dan askar-lasykar ang tetap DLL. HAL ini Di perincikan Dalam Federal Army (Pay and allowances) Regulations 1961. Seksyen ini MAT boleh diberikan kuat kuasa kebelakangan kepada apa2 tarikh, Sama ada sebelum atau selepas permulaan berkuat kuasa Akta AT72. Sek. 187(1) membuat peraturan2 berkenaan dengan gaji bersara, pencen, ganjaran dan pemberian lain; Dan peraturan2 ITU boleh menyatakan syarat yang meliputi pemberian Dan kadar gaji bersara, pencen, ganjaran Dan pemberian lain itu, dan boleh mengadungi apa2 peruntukkan lain Yang mungkin perlu dan boleh diberikan kuat kuasa kebelakangan kepada apa2 tarikh, Sama ada sebelum atau selepas permulaan berkuat kuasa Akta AT72. Apa Yang saya nyatakan di atas ada lah sebahagian kecil kuasa MAT yang sangat luas, tetapi kuasa ini tidak di Ikuti secara undang2 kerana orang politik terutama Menteri Pertahanan dan KSU mengambil alih membuat peranan ini. Akhirnya ATM di perlemahkan mengikut cita Rasa mereka. Ingin saya beritahu bahawa Kementah Dan ATM adalah dua identiti Yang berbeza. Kementerian Pertahanan Di terajui oleh Menteri Pertahanan dan Di Bantu oleh seorang Timbalan Menteri. Organisasi Kementah mengadungi anggota perkhidmatan awam Yang diketuai oleh Ketua Setiausaha (KSU). ATM Di ketuai oleh PAT. Beliau adalah ketua professional ATM Yang dilantin oleh SPB YDPA. PAT memerintah dan mentadbir ATM melalui Jawatankuasa Panglima2 (JPP). Hal2 pemerintah, Tata tertinggi Dan pentadbiran ATM Dan segala perkara Yang berhubung dengannya diuruskan oleh MAT. APA yang belaku sebenarnya dari hal pentadbiran ATM? Pada tahun 1981, Satu badan Yang mengabungkan perintah tertinggi ATM (MAT) dan Awam Kementah Yang di namakan Lembaga Menteri telah di ujudkan. Lembaga ini dengan secara tidak langsung hilangkan kuasa MAT. Lembaga menteri telah menjadi satu badan Yang meyelesaikan Dan menghuraikan masaalah Kementah keseluruhan nya kecuali berkaitan operasi. Jika Kita buka sesawang Kementah Di http://www.mod.gov.my/ms/mengenai-kami/carta-organisasi.html Kita Akan dapati PAT Di letak di bawah KSU Kementah. Keadaan sekarang menjadi lebih malang kepada ATM/MAT di mana Lembaga Menteri Yang saya katakan tadi telah di tukar Nama sebagai KUMPULAN PENGURUSAN ANGKATAN TENTERA. Ahli MAT Yang Di tetapkan oleh Perlembagaan Persekutuan telah di tambah menjadi 17 dengan bertambah nya 7 orang awam Dan Salah seorang ahli dalam MAT adalah Timbalan Ketua Pengarah perkhidmatan Awam (Pembangunan) dari JPA. Kesan Dari ini, Kita dapati banyak hal hal ATM terutama syarat2 perkhidmatan dan hal gaji telah di harmonikan dengan sistem perkhidmatan awam. iii. Perkhidmatan Awam am persekutuan. Perkhidmatan awam bersama Yang disebut Dalam perkara 133.
vii. Perkhidmatan awam setiap Negeri. Angkatan Tentera Malaysia adalah Yang terkanan sekali dalam senarai protokol perlembagaan persekutuan. Tetapi oleh kerana pencabulan Yang telah di buat oleh orang politik Barisan Nasional Dan Perkhidmatan awam, dan tidak ada seorang pun panglima2 ATM Yan bangun bersuara Dan menentang pencabulan undang2 di dalam perlembagaan persekutuan, Kita boleh lihat bertapa lemah nya ATM untuk membetulkan keadaan ATM Dan Veteran. APA Yang belaku Angkatan Tentera sekarang telah jatuh dari tangga teratas menjadi sama dengan Polis Yang duduk Di tangga keempat Dan pangkat Dan gred Mereka telah Di harmonikan dengan perkhidmatan awam. Semua anggota ATM Dan Veteran tahu syarat2 perkhidmatan Dan Gaya hidup ATM tidak sama dengan Awam Dan Polis. Tetapi kenapa ATM harus ikut gaji Dan syarat2 perkhidmatan tertentu awam? Di mana Keadilan Yang Di beri kepada ATM? Perubahan2 syarat2 ini Akan secara langsung tempias kepada kedudukannya Veteran ATM. Pesara terpaksa ikut sistem Pesara Awam Yan rata2 mereka semua berumur 60 tahun keatas. Dan telah berkhidmat lebih dari 35 tahun. Pehinaan terhadap ATM sudah bermula 45 tahun lalu (lihat penerangan Siri Satu saya). Saya Akan ulas lebih banyak isu2 pencabulan undang2 Yang Di lakukan pada ATM Dalam Siri2 penerangan saya Yang berikut nya. Untuk mengubah nasib kita, Kita Mesti tolak BN Dan gantikan dengan kerajaan Yang Di pimpin oleh Parti politik baru. Begitu panjang dan lebar tetapi agak dangkal dan terlalu beremosi dalam penyampaian. Penulis di atas mungkin kurang mahir dalam penterjemahan Perlembagaan Persekutuan, dan lebih gemar memilih peruntukan-peruntukan dalam Perlembagaan yang memihak kepada apa mesej yang hendak disampaikan, dan tidak memberi gambaran yang penuh. Pada permulaannya penulis telah memberi gambaran bahawa apa jua undang-undang yang tidak selaras dengan Perlembagaan adalah tidak sah setakat ketidak adilan itu. Semasa isu kalimah Allah menjadi besar akibat pengharaman penggunaannya di dalam Kitab Injil Bahasa Melayu mengikut Enakmen Jenayah Syariah Negeri Selangor, ramai yang menyatakan bahawa Enakmen tersebut adalah bertentangan dengan Artikel 3(1) dan 11(1) Perlembagaan Persekutuan. Namun, Enakmen tersebut adalah merupakan suatu Enakmen yang telah diluluskan oleh Dewan Undangan Negeri Selangor yang ahli-ahlinya juga termasuk mereka yang bukan beragama Islam. Ianya adalah Enakmen yang digunapakai bukan sahaja ke atas mereka yang beragama Islam tetapi juga, di mana sesuai, digunakan ke atas mereka yang tidak beragama Islam. Sehingga ada suatu Mahkamah Perlembagaan yang memutuskan Enakmen tersebut tidak sah dari segi Perlembagaan, maka ianya tetap sah dan diterima pakai oleh semua. Begitulah juga kaedahnya dengan undang-undang lain yang dianggap mencabuli hak asasi rakyat Malaysia menurut Perlembagaan Persekutuan. Melalui Artikel 41 Perlembagaan Persekutuan, Yang DiPertuan Agong adalah pemerintah tertinggi Angkatan Tentera Malaysia. Namun, apa jua tindakan yang diambil oleh YDP Agong adalah di atas nasihat yang diberikan oleh Perdana Menteri dan jemaah Menteri (Kabinet). Artikel 40(2) yang disebut-sebut hanyalah berkenaan perlantikan Perdana Menteri, menangguhkan pembubaran Parlimen (Dewan Rakyat), meminta untuk Majlis Raja-Raja bersidang. Artikel 40(3) pula menyebut Undang-Undang Persekutuan boleh membuat undang-undang di mana Yang DiPertuan Agong boleh bertindak selepas dinasihati oleh orang-orang yang selain dari Jemaah Menteri selain fungsi yang boleh diambil tindakan mengikut budibicaranya. Ini bermakna, YDP Agong boleh juga membuat tindakan lain selepas mendengar nasihat lain-lain orang selain Jemaah Menteri. Sebagai contoh: mengambil nasihat daripada Badan Kehakiman, Kepolisian dalam hal-hal berkenaan Perlembagaan, Perundangan dan Keselamatan. Hakikatnya, kuasa yang ada pada YDP Agong hampir kesemuanya dijalankan oleh Perdana Menteri mengikut Artikel 39 di mana kuasa YDP Agong diperturunkan kepada Perdana Menteri dan Jemaah Kabinet, dan YDP Agong bertindak di atas nasihat. Bertindak mengikut budibicara di sini bermaksud mengambil sesuatu keputusan untuk bertindak setelah menerima nasihat. Ini bermakna, YDP Agong adalah “de jure head of the state” (Ketua Negara yang sah) manakala Perdana Menteri adalah “de facto head of government” (Ketua Hakiki Kerajaan ). Maka, kuasa yang diperturunkan oleh YDP Agong untuk mewakilinya di dalam urusan pentadbiran dan lain-lain urusan berkenaan Angkatan Tentera Malaysia diberikan kepada seorang Menteri Kabinet yang dipertanggungjawabkan sebagai Menteri Pertahanan. Menteri Pertahanan menjalankan kewajipan mewakili YDP Agong, dan bertanggung jawab terhadap Perdana Menteri Malaysia. Ini bermakna, kesetiaan Angkatan Tentera Malaysia kepada Raja dan Negara bermakna kesetiaan juga kepada Kerajaan YDP Agong yang telah dipilih oleh rakyat dan dibentuk dengan titah YDP Agong. Berkenaan Artikel 137 berhubung MAT yang dibangkitkan oleh penulis, tiada sebarang pencabulan berlaku di situ kerana sepertimana yang telah diterangkan di atas, Menteri diperuntukkan kuasa oleh YDP Agong melalui Artikel 39 untuk menjaga hal ehwal Pertahanan. Apa jua undang-undang yang dibuat mengenai Angkatan Tentera Malaysia termasuk Akta Angkatan Tentera, 1972, adalah merupakan undang-undang yang dibuat di bawah Perlembagaan Persekutuan dan diluluskan oleh badan perundangan (Parlimen) untuk Menteri yang dipertanggung jawabkan serta Kementeriannya menjalankan tugas. Tidak ada mana-mana peruntukan di bawah Artikel 132(1) Perlembagaan Persekutuan menyatakan senarai perkhidmatan awam tersebut adalah mengikut kekananan. Angkatan Tentera Malaysia bukanlah suatu perkhidmatan awam yang paling kanan kedudukannya berbanding lain-lain perkhidmatan awam. Ia hanya mainan persepsi yang dibuat oleh penulis. Wasiat Raja-Raja Melayu ini dibuat sejurus sebelum berlakunya Kemerdekaan Tanah Melayu. Ini adalah wasiat daripada Raja-Raja Melayu kepada rakyat di setiap negeri. Untuk memahami wasiat ini, kita perlu fahami bahawa kemerdekaan yang kita capai bukanlah daripada pihak British sebenarnya. Kita imbau kembali sejarah penubuhan pembentukan Persekutuan Tanah Melayu yang merdeka. Selain Melaka, Pulau Pinang, Singapura, dan (buat seketika) jajahan Dinding dan Pangkor, tidak ada mana-mana negeri dalam Tanah Melayu yang telah dijajah oleh British. Kemasukan British ke Tanah Melayu dan seterusnya perkenalan sistem pentadbiran British adalah disebabkan perjanjian-perjanjian di antara pihak British dengan Raja di setiap negeri. Kuasa eksekutif Sultan diperturunkan kepada seorang Residen (Reseden-Jeneral bagi negeri-negeri Bersekutu iaitu Perak, Selangor, Pahang dan Negeri Sembilan). Residen-residen ini adalah digajikan oleh Raja negeri-negeri di mana mereka berkhidmat. Apabila perbincangan untuk kemerdekaan berlaku, ianya adalah di antara kerajaan British (sebab mereka mempunyai perjanjian dengan Raja-Raja), Raja-Raja Melayu (kerana mempunyai perjanjian dengan pihak British), dan wakil rakyat Malaya yang diwakili oleh Parti Perikatan (UMNO, MCA, MIC). Perbincangan ini berkitar mengenai pembubaran perjanjian, pemerintahan sendiri oleh kerajaan yang dipilih rakyat. Maka, apabila berlakunya kemerdekaan Tanah Melayu, kuasa eksekutif yang selama ini dipegang oleh Residen British, diserahkan pula oleh Raja-Raja Melayu kepada kerajaan yang dipimpin oleh Perdana Menteri. Kemerdekaan kita adalah dari sistem feudalisme, bukan penjajahan. Saya dapati penulisan ini menggambarkan sama ada penulis sebenarnya keliru dengan peruntukan-peruntukan dalam Perlembagaan Persekutuan, atau sengaja mahu mengelirukan pembaca disebabkan sandaran politiknya. Pun begitu, sekiranya inilah yang terbaik yang boleh dibentangkan, nasihat saya kepada beliau adalah untuk banyakkan membaca dan berlaku adil serta tanamkan sikap dan minda yang terbuka. Penulis nampaknya jahil mengenai sejarah Perlembagaan Persekutuan. Menjadi seorang peguam tidak bermakna anda mahir dari segala selok-belok perundangan dan perlembagaan. Bak kata seorang novelis US bernama Edna Ferber: “Minda yang tertutup adalah minda yang menghadapi kematian.” Oleh itu, jangan dijumudkan lagi minda itu hanya kerana fahaman politik peribadi. I am appalled that there still are those who deny the roles played by the non-Malays in defending this country, especially during the two Emergencies; that dark 33 years of fighting communism. The history books emphasised more on the 12-year First Emergency because of its relation to the independence of Malaya, thus many forget that not too long-ago bombs were going off in the middle of Kuala Lumpur while ordinary policemen were getting slayed. The First Emergency broke out in June 1948 with the murder of three British estate managers in Sungai Siput. Fuelled by the progressive successes the Communist Party of China was having against the Kuomintang, the acts of banditry increased exponentially. Based on a priori the British found it best to both resettle the Chinese in camps while between 20,000 to 50,000 be sent back to China. The plan moved at a snail’s pace due to the objections by many, and with the total withdrawal of the Kuomintang to Formosa, the repatriation of the Chinese came to a halt in September 1949 when the Communist Party of China closed off all ports and beaches. Only 6,000 Chinese from Malaya were sent back (Anthony Short, 1975 pp 178-201). The rest were settled in new villages to curb them from supplying the Communist Party of Malaya with food and other essentials. When Ismail Mina Ahmad, the chairman of the Ummah umbrella group for Muslim organisations, claimed that only the Malays fought against invaders and communists in this country, it shows the level of ignorance on his part (Syed Jaymal Zahiid – In fiery speech cleric tells forum only Malays fought invaders communists, Malay Mail Online, 13 January 2018). His claim is far from the truth. At the peak of the First Emergency, the British had to not only bring in members of the Palestine Police Force who were experienced in counter-insurgency warfare, but also recruited a large number of Chinese residents of Malaya. Tan Sri Dr Too Chee Chew, more famously known as CC Too, headed the Psychological Warfare section. We had the likes of Tan Sri Jimmy Koo Chong Kong, Tan Sri Yuen Yuet Ling, Datuk Leong Chee Woh to name a few who spent most of their lives fighting the communists. CC Too, Koo Chong Kong and Yuen Yuet Ling were among the ranks of the Malayan People Anti-Japanese Army (MPAJA) during the Second World War who chose to go against their former comrades and became targets of the Communist Party of Malaya. Jimmy Khoo Chong Kong, who was also a former member of the Sarawak Communist Party before surrendering to the authorities and joining the Royal Malaysian Police, paid with his life on 13 November 1975 in Ipoh, Perak, as did his driver Constable (awarded Sergeant posthumously) Yeong Peng Cheong who died with his gun blazing. Without hesitation, even with the knowledge that he was also on the hit list, Tan Sri Yuen Yuet Ling replaced Tan Sri Koo as the Perak Chief Police Officer. When a Royal Malaysian Air Force Sikorsky S-61A Nuri helicopter was shot down in Gubir, Kedah on 27 April 1976, three Malaysian Chinese personnel were also among the 11 killed. They were Captain Choo Yeok Boo TUDM, Lieutenant Chung Ming Teck TUDM and Sergeant (Air) Leong Yee Heng. They were on a resupply mission from the Butterworth Air Base when they were shot down. Captain Frank Chong Keng Lay TUDM (retired as Lieutenant-Colonel) flew his Nuri into a hot landing zone to rescue several infantrymen. His two commando escorts were killed as his Nuri took 22 heavy machinegun shots. The next day he flew into the same landing zone to repeat the task. Keng Lay was my Chief of Staff at the RMAF Air Training Command where I was a Staff Officer and later its Adjutant. Inspectors Kamalanathan and Robert Cheah were inside a coffee shop meeting with informers when a terrorist threw a grenade into the shop. The explosion maimed Kamalanathan and for the rest of his life he walked with an obvious limp with a grenade shrapnel still embedded in his leg. There were many other non-Malay police officers in particular those who served in the Special Branch who died as unsung heroes as they were not recruited nor trained with other policemen. They were the deep infiltrators, members of the community, who went on leading a double life that even their own family did not know they were all policemen. Their pay did not come from Bluff Road (Bukit Aman) directly. DSP Jeganathan was a Jabatan Talikom employee tasked with setting up the police’s VHF network and spent years jungle-bashing, building towers on mountain and hilltops with the communist terrorists hot on his heels so that the police could have a nationwide communications network. There were those who were just roadside sweepers working for the municipal and town councils, collecting information. One had his cover blown when he was discovered in a different town by a neighbour asking him loudly what was he doing there sweeping the streets. 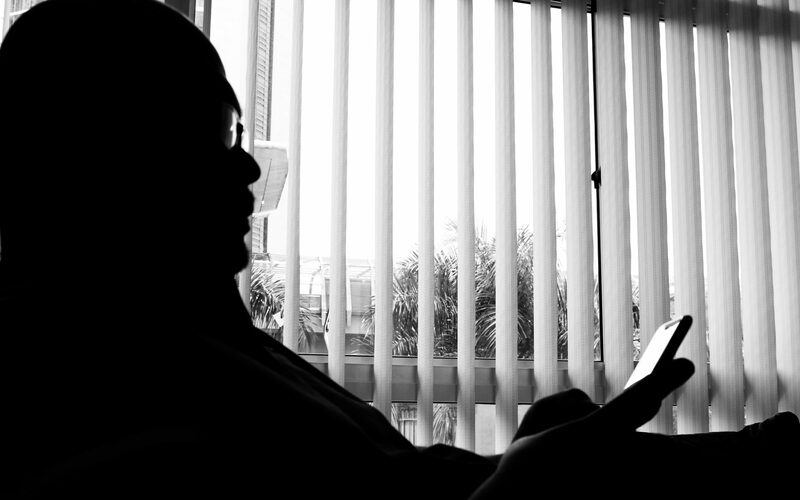 Another was on his death bed, ridden with cancer, when he sought the help of a Malaysian daily to contact my father to tell the latter of his condition. His real name was quoted by the daily to my father, which my father could not recall. My father asked the contact in the daily to ask him his Special Branch name. When the reply came, my father left his golf game and rushed to the hospital and after more than 50 years of being married, the wife and family finally knew the man-of-their-house was a hero fighting the communists, not just some small-time trader. Let us not forget Chief Inspector Chin Chin Kooi. He was a Special Branch officer probing communist activities in Serdang, Kedah. At 9pm on 12 July 1973, six communist terrorists stormed into his home and let loose a volley of bullets. Mortally wounded, Chin returned fire until his last breath. Across the South China Sea, Police Field Force Superintendent Joni Mustapha was a champion Sarawak hurdler from 1958 to 1959. Joni was watching a movie with his son in Sibu when a policeman relayed a message to him that his men were being pinned down by communist terrorists upriver Sungai Setabau. He asked the policeman to stay with his son in the cinema and left to rescue his men. Constable Nuing Saling, an Iban policeman, was on a two-week leave to be with his wife Imbok Jimbon who was six months pregnant with their third child. Upon hearing that Joni was leaving for the jungle, hurriedly joined the team. Both Joni and Nuing had made a pact that they would help each other. They left by boat to get to the location. Upon arrival, they engaged the communist terrorists. Joni was felled by machinegun fire but remained conscious to direct the firefight until he died. Another constable friend, Abang Masri was already dead. Seeing his commander and friend die, Nuing unsheathed his machete and charged at the terrorists’ position firing at them, only to be mown down. He had been hit in the face by a bullet. Nuing refused to give up. He continued his charge and was hit several times more but kept on charging, killing and wounding many. He died inside the location of the communist terrorists. Kanang ak Langkau is perhaps the most known warrior from Sarawak who shed blood and tears fighting against the communist terrorists. He was wounded several times but not once let his wounds stop him from fighting. These are stories that we should all remember. Stories of our non-Malay brethren heroes who risked and gave their lives so that we can all enjoy the peace and prosperity that God has bestowed upon us. Many more have gone unsung, but they shall not be forgotten. Especially not by selfishly ignoring the sacrifices that have been made by them. For the previous installment on religion, please click HERE. Dr Jeffrey Kitingan also raised the point on language on pages 11-12 of his book, ‘The 20 Points – Basis for Federal – State Relations for Sabah, 1987′. Language was the second point of the 20-Point Memorandum put forth before Malaysia was formed. 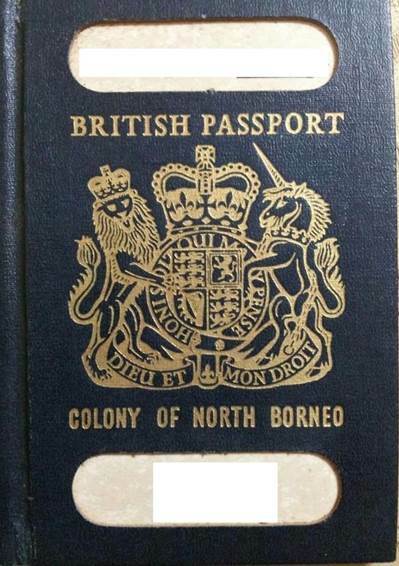 English should be the official language of North Borneo, for all purposes, State or Federal, without limitation of law. Dr Jeffrey wrote that it was Tun Mustapha’s administration that had changed the status of English by passing a bill and introducing a new clause 11A into the State Constitution, making Bahasa Malaysia the officia language of the State Cabinet and the State Legislative Assembly. At the same time, he claimed, the National Language (Application) Enactment, 1973 was passed purporting to approve the extension of an Act of Parliament terminating or restricting the use of English for other official purposes in Sabah. He also said that the National Language Act, 1963/67 was only amended in 1983 to allow it to be extended to Sabah by a State enactment, but no such enactment had been passed. Therefore, the National Language Act, 1963/67 is still not in force in Sabah. Many civil servants who were schooled in English are employed as temporary or contract officers because of their inability to pass the Bahasa Malaysia examination. The change in the medium of instruction in schools have affected the standard of teaching due to lack of qualified Bahasa Malaysia teachers. The teaching of other native languages has been relegated to the background. Now, let us see what the Malaysia Solidarity Consultative Committee (MSCC), the Cobbold Commission, the Inter-Governmental Committee (IGC) as well as the Federation of Malaysia Agreement had to say about the points raised above. 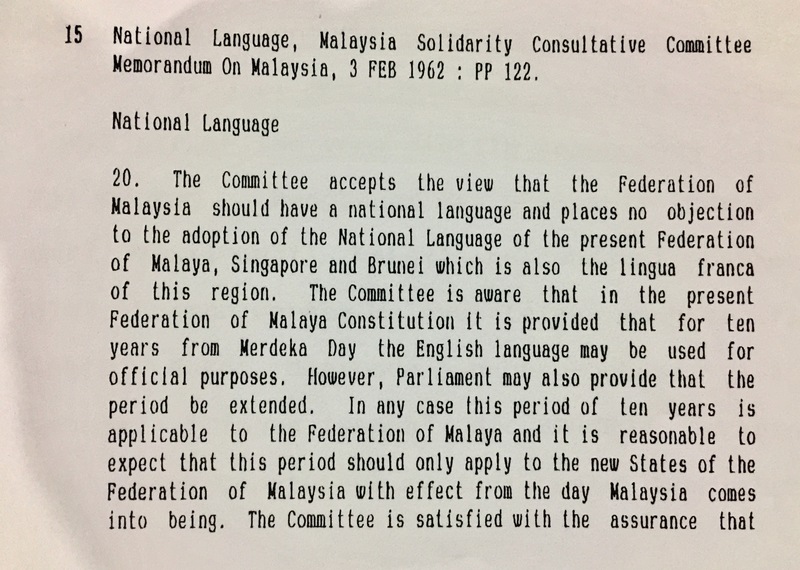 On Page 122 of the MSCC Memorandum, the Committee accepted that the Federation should have a national language and placed no objection to the adoption of the National Language of the Federation of Malaya, Singapore and Brunei (the Malay language) as it is the lingua franca of the region. However, the MSCC had asked the Parliament to make provision for the English language to remain to be used for a period of TEN YEARS after the formation of the new Federation in 1963. This is in light of the same period given to the states in the Federation of Malaya in the Federation of Malaya Constitution that is TEN YEARS after 1957. 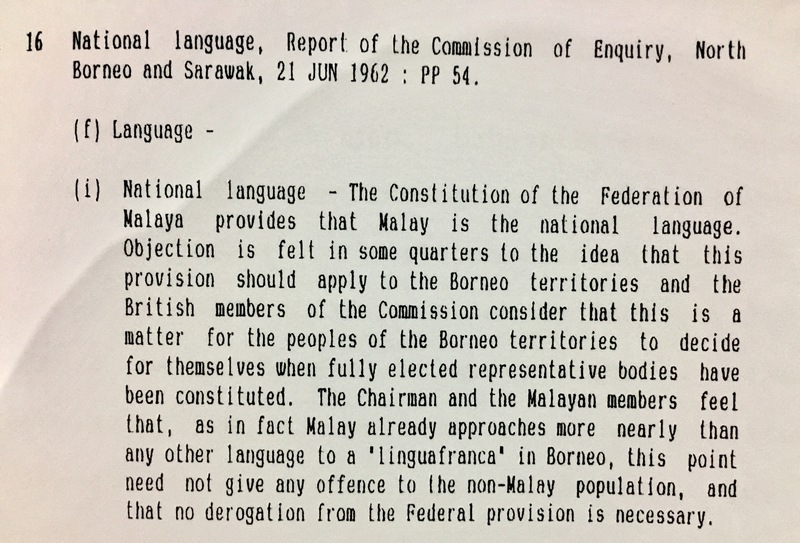 According to the Report of the Commission of Enquiry, North Borneo and Sarawak (the Cobbold Commission) dated 21 June 1962 on page 54, the objection to the use of Bahasa Melayu as the language of the Federation and its application to North Borneo and Sarawak are matters that the people of the two states should resolve themselves when fully-elected representative bodies have been constituted. The Chairman and members from Malaya do not think that their opinion of Bahasa Melayu being the language closest to those spoken in the region and therefore should be the lingua franca should not offend the non-Malays and any derogation from the Federal provision is necessary. On the issue of official languages the Cobbold Commission found that there is majority support for both Bahasa Melayu and English to be used as the official languages in both the Borneo states without any time limit. This was the view of the Chairman of the Commission and its British members. 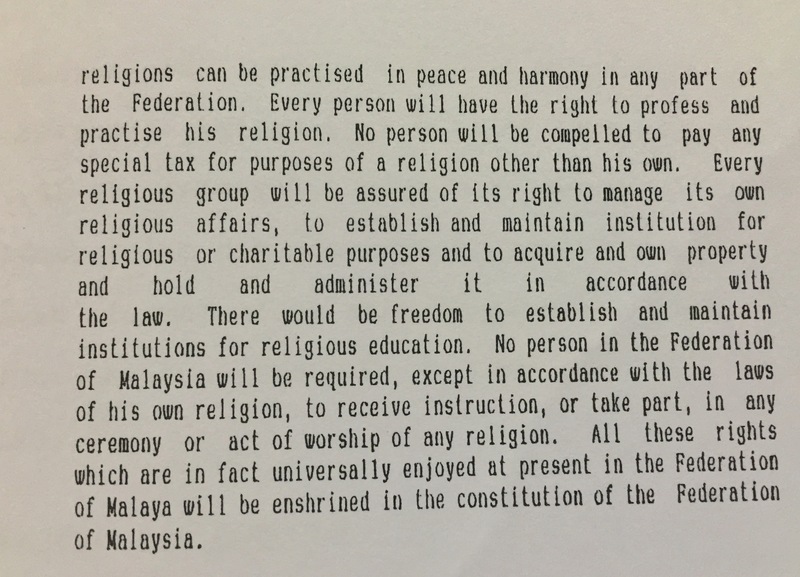 The members from Malaya however thought that with MALAYSIA in total consideration such provision cannot be accepted as it breaches the existing provisions in the Federation of Malaya Constitution. 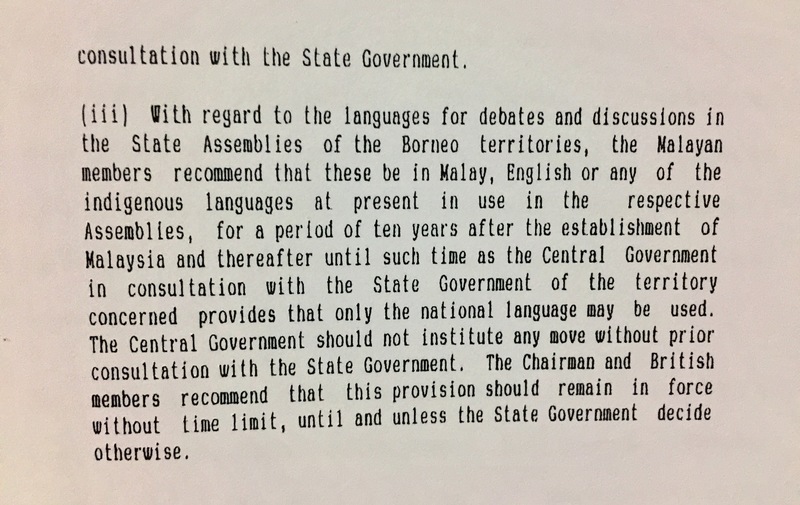 Therefore the Malayan members recommend that a provision be made without affecting the position of Bahasa Melayu as the official language of the Federation where English shall continue to be an official language in the states of North Borneo and Sarawak along with Bahasa Melayu for a period of ten years after the establishment of the Federation of Malaysia. This shall continue until such time the Federal government in consultation with the State governments provides otherwise. The same was recommended for application to the indigenous languages used in debates and discussions in the respective state assemblies. The Chairman and the British members however opined that there should be no time limit applied to the indigenous languages, until and unless the State governments decide otherwise. 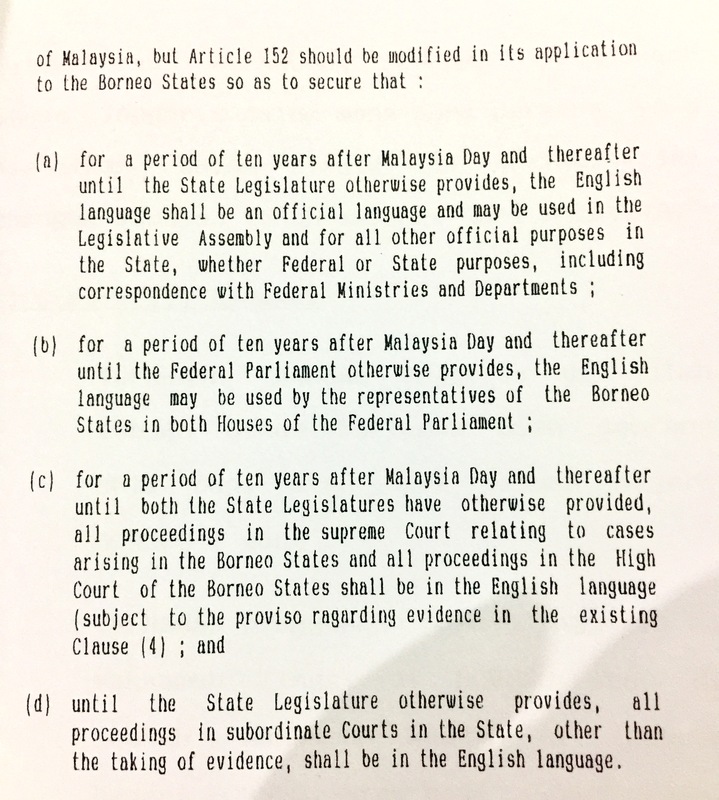 For a period of TEN YEARS after Malaysia Day and until the State Assemblies provide otherwise, English becomes an official language not just for the State Assemblies but also in other official purposes of both State and Federal, including correspondences with Ministries and Federal departments. For a period of TEN YEARS after Malaysia Day and until the Parliament of Malaysia provides otherwise, English shall be allowed to be used by representatives from the Borneo states in both Houses of Parliament. For a period of TEN YEARS after Malaysia Day and until both State Assemblies provide otherwise, all proceedings in the Supreme Court for cases involving cases from the Borneo states and all proceedings in the High Courts of both Borneo States shall be conducted in English. Until the State Assemblies provide otherwise all proceedings in the subordinate Courts in the Borneo states other than the taking of evidence, shall be in English. Of course at the end of it all parties agreed upon something hence the Federation of Malaysia Agreement, 1963 was signed. So what does the Agreement say? 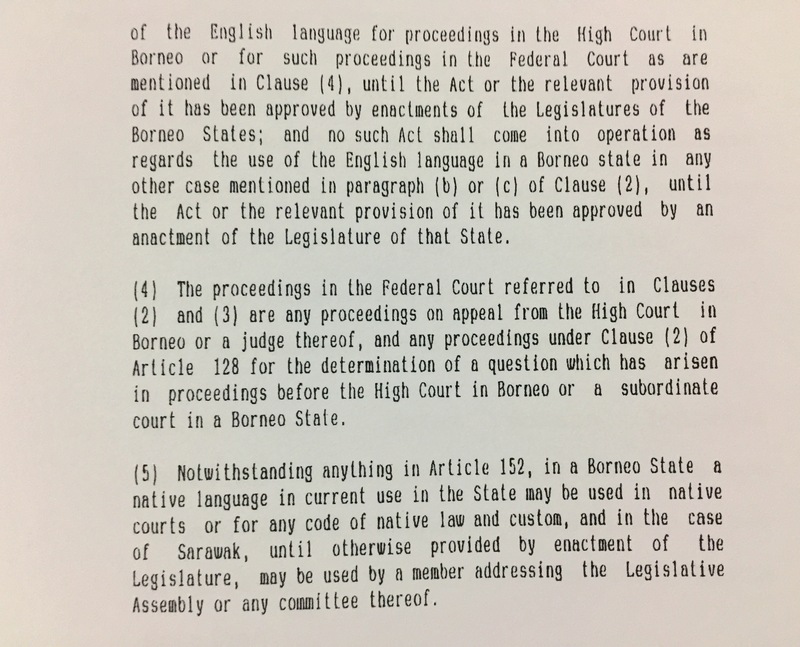 the use of native languages in the native courts and in the case of Sarawak, the use of native languages in the State Assembly until otherwise provided for by an Enactment of the legislature. 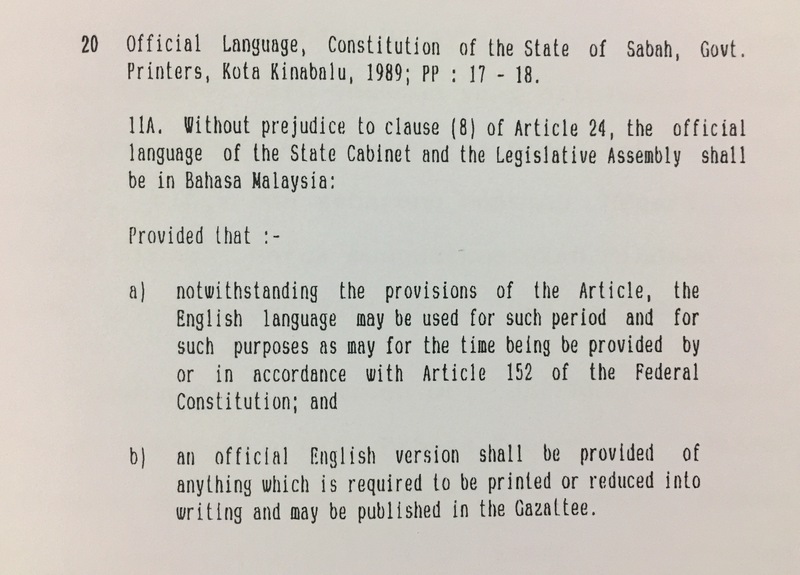 During the Tun Mustapha Administration the status of the English language was altered in a bill by inserting a new clause called Clause 11A into the Sabah State Constitution, 1989 (pages 17-18), making Bahasa Malaysia as the official language of the Sabah Cabinet and of the State Legislative Assembly. However, Jeffrey disputes the passing of the National Language (Application) Enactment, 1973 that allegedly allows the application of an Act of Parliament to terminate or restrict the use of the English language for other official purposes in Sabah. This preceded the National Language Act 1963/67 that was only amended in 1983 to allow it to be applied to Sabah through a state enactment. Nonetheless, there was no state enactment on the matter that was passed as of 1991. As such, as of 1991 the National Language Act, 1963/67 was still not enforced in Sabah. 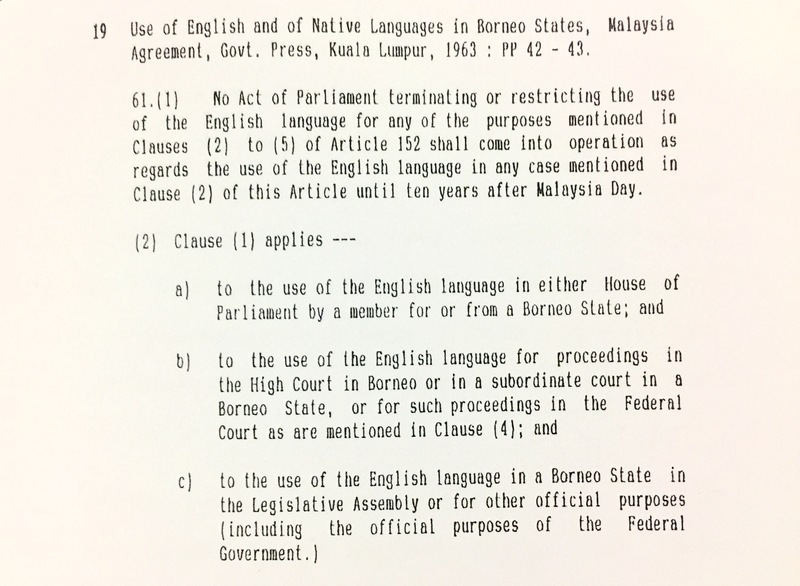 Based on the Federation of Malaysia Agreement (Malaysia Agreement), 1963, it is clear that the position of the English language as an official language can be altered TEN YEARS after Malaysia Day. It was put into force through a law that was enacted by the State Legislative Assembly of Sabah in 1973. Having said that, no specific enactment was passed as of 1991 to enforce the National Language (Amendments and Extension) Act, 1983 in Sabah. Jeffrey Kitingan’s assumptions and allegation pertaining the illegality of the National Language Act, 1963/67 and State Enactment No.7, National Language (Application) Enactment, 1973 which preceded the National Language (Amendments and Extension) Act, 1983 by ten years was more of playing a regional sentiment especially in the context of teaching and learning of the indigenous languages in Sabah. Questioning the use of Bahasa Malaysia as the official language after 27 years of Sabah being part of the Federation of Malaysia clearly displays the arrogance on Jeffrey’s part, and his refusal to accept the fact that the Bahasa Malaysia is the reflection of the spirit of the people of Malaysia that forms a bridge for all races towards national integration. In the next installment, we shall talk about the third point – CONSTITUTION. For the previous installment on the background, please click here. In his book on Page 101, Dr Jeffrey Kitingan wrote that although there is no objection to Islam being the religion of the Federation there should not be a STATE RELIGION in North Borneo. Therefore, anything pertaining to Islam in the MALAYAN CONSTITUTION cannot be applied to NORTH BORNEO. His grouse on this matter came about as a result of the late Tun Datu Mustapha expelling Christian priests from Sabah and accused both Tun Datu Mustapha and Datuk Harris Salleh of acting in such manner to strengthen their political position with the Federal government, therefore Islam should not be the religion of the state of Sabah. The above controversial statement goes against the agreements reached as recorded by the Cobbold Commission, the Malaysia Solidarity Consultative Committee (MSCC) , and the Inter-Governmental Committee (IGC) in 1962. The MSCC had scrutinised the position of Islam in respect of states other than the Malay States and found no objection was made against the then-present arrangement for Pulau Pinang and Melaka to also be adopted by North Borneo, Sarawak and Singapore. Each of the states above would have its own constitution to address the requirement with Yang DiPertuan Agong as the Head of Islam in those states. The respective State’s Assembly will enact laws to govern Islamic affairs and form a Board to advise the Yang DiPertuan Agong on matters pertaining to Islam. 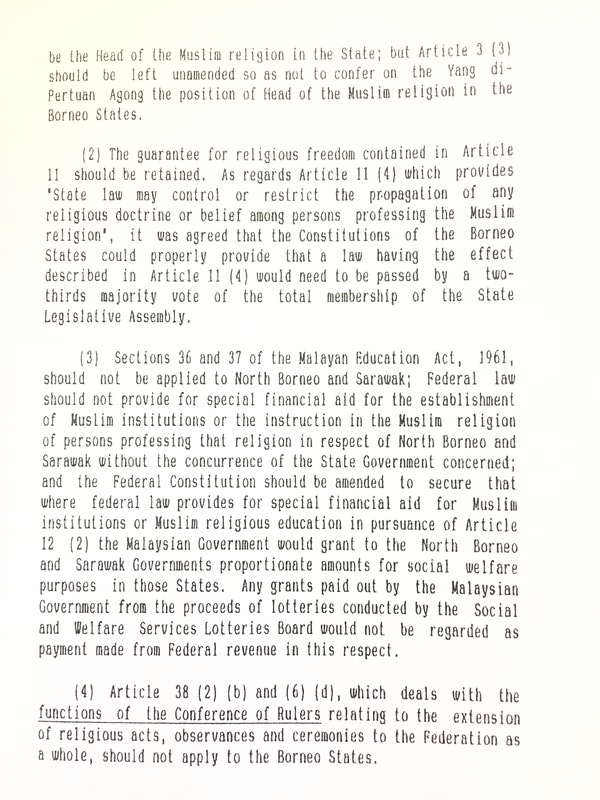 In the Report of the Commission of Enquiry (Cobbold Commission), North Borneo and Sarawak, dated 21st June 1962 found that there was everywhere agreement that as the Muslims are minorities in North Borneo and Sarawak, there should be no restrictions on complete freedom of other religions in those states. The IGC, which has representation from the Federation of Malaya representing the states in the Federation, Singapore, North Borneo and Sarawak, recommended that Article 3 needed no amendment. However, the provision of financial aid to Muslim establishments should only come with the concurrence of the states of North Borneo and Sarawak. This has since been provided for via Section 3 of the Sabah Islamic Laws Administration Enactment, 1992 where the Yang DiPertuan Agong is the Head of Islam in Sabah, and a Council (Majlis Agama Islam Sabah) was formed to manage and administer the Islamic affairs in Sabah. This has also been provided in the Sabah State Constitution (Articles 5B(1) and 5B(2)). As mentioned at the beginning of this article, Dr Jeffrey Kitingan was angered by Tun Datu Mustapha’s action to chase out Christian missionaries from Sabah in 11972. Dr Jeffrey used this as the basis of raising the religion issue that was presented as part of the 20-point memorandum for the inclusion of Sabah into the Federation of Malaysia. Having understood the reason for his raising the issue again, we must also understand the events that had taken place after Tun Datu Mustapha’s ousting of the Christian missionaries. Parti Bersatu Sabah (PBS) won the state elections and formed the Sabah state government in 1985. From that point up until 1991, the Sabah state government built 825 churches compared to only 216 suraus and mosques. The state government’s refusal to entertain a request by the Sabah Islamic Council made on the 2nd August 1986 and again on the 12th August 1986 to amend the state’s Shariah Law (Administration) Enactment No.15/77 to accord to the Yang DiPertuan Agong the power to administer Islam in the state of Sabah as required by Article 3(3) of the Federal Constitution (as amended on the 12th August 1976) and Article 5B of the Sabah State Constitution (as amended on the 28th December 1985) clearly denied the Yang DiPertuan Agong His Majesty’s prerogative that was agreed by the Malaysia Solidarity Consultative Council, the findings of the Cobbold Commission as well as the Inter-Governmental Committee, and the wishes made by the Muslims of North Borneo in 1962. The ousting of the Christian missionaries in 1972 was made because the nine missionaries who were foreigners abused the work permit given to them to work in Sabah, not to conduct evagelical missions. They were Roman Catholics, Anglicans, the Basil Mission and from the Borneo Evangelical Mission. As Immigration affairs is a Sabah prerogative as accorded in the Federal Constitution of Malaysia, the first act by the Sabah state government under Tun Datu Mustapha was to deny them an extension of their work permit. They were then given a 14-day special pass to enable them to make arrangements to leave Sabah. However, the missionaries refused to obey the 13-day order. Consequently, they were removed from Sabah through a Removal Order issued by the Sabah Immigration Department made under Section 32 of the Immigration Ordinance 12/59. The Federal government had no role whatsoever in the removal of these missionaries. It was purely a state decision that was made based on a sound reason – the people of Sabah, regardless of race or religion had been living harmoniously. However, these missionaries have been sowing the seeds of hatred among the Christians of Sabah towards the Muslims by telling them to fear the “Islamisation” of Christians through forced conversions, a claim the missionaries themselves could not substatiate. There was a plea made by the Christians in Sabah to the then-Prime Minister for the missionaries to be allowed to remain in Sabah. Tun Abdul Razak however recommended to the Christians of Sabah to instead allow priests from the Peninsular and Sarawak to replace the nine missionaries. In his book, Jeffrey Kitingan had profusely spoken about alleged digressions from and breach of the Federation of Malaysia Agreement but avoided on the issue of the Sabah state government of 1985 breaching agreements made by the MSCC, findings of the Cobbold Commission, the IGC as well as the Federal Constitution of Malaysia. On the contrary, the Federal government has been fulfilling its end of the agreement by allowing the freedom for other religions to be practiced by its followers as per the agreement. At no point was there any intrusion made by the Federal government in the affairs of Sabah, and that the removal of the missionaries from Sabah for violating the conditions of the work permit was totally a state issue, made using the powers accorded to the state of Sabah, as agreed by all parties that had agreed on the formation of the Federation of Malaysia. In the next installement, we shall talk about the second point – LANGUAGE.